There are so many different commercial cleaning products these days, filled with toxic chemicals and wrapped in elaborate plastic packaging. There are endless marketing efforts to get you to buy the newest, best smelling and most powerful disinfectant for your everyday cleaning needs. But the reality is, keeping it simple and switching to DIY cleaners can provide you will all you need for a sparkling clean and sanitary home. Making your own will not only reduce your use of plastic, but dramatically lessen the environmental and household pollution caused by the manufacture, use and disposal of these products. Many of the ingredients used in regular household ingredients are carcinogenic, trigger asthma and allergies, cause endocrine disruption, antibiotic resistance, and skin irritation, to name a few things. This is why I have felt the push to switch to only purchasing non-toxic cleaners, as well as making my own. So if you're like me, and want to make this switch, then here are the basics to get you started. Firstly, I want to share some of the individual natural ingredients you should get your hands on to start cleaning your home, why they're so great and what they can do. Baking soda has been used for over a century as a way to deodorise, clean and scour away dirt. You can easily use this alone to clean sinks, toilets, baths, ovens, fridges and surfaces to remove dirt and stains. One of the most versatile products you can buy, castile soap can be used as an all purpose cleaner all around your home. 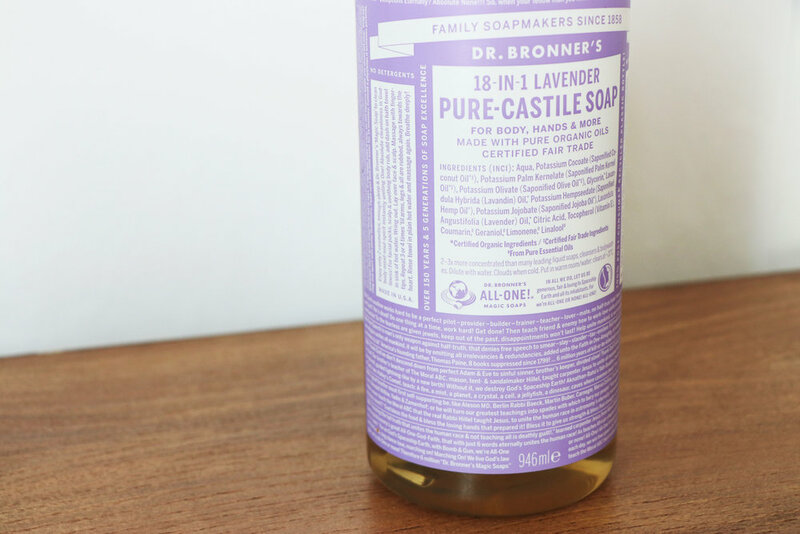 From laundry detergent, to dish soap, hand soap, floor cleaner and even shampoo, castile soap has got you covered. Another incredible multi-purpose product that can be used all over the home to get rid of stains, grease, dirt, odours, mould and mildew is white vinegar. It may have a slightly off-putting smell, but this quickly dissipates, or can be counteracted by delicious smelling essential oils. A very strong acid, the juice of a lemon helps to fight against bacteria, remove stains and keep your whites white. Perfect for polishing furniture, olive oil is great at loosening up stains, grease and grime on all sorts of surfaces. Naturally anti-bacterial, essential oils not only help to sanitise your house, but keep it smelling great too. Some of the best to go for are lavendar, tea tree and lemon. Salt is a super versatile mineral that has a nifty way of scouring off dirt. It will also boost the cleaning effects of other ingredients, such as vinegar or bicarbonate of soda, when combined together. These magical berries produce a natural soap, called saponin, that foams up and removes grime and smells when mixed with water. They're anti-fungal, anti-bacterial and anti-microbial, working as a great eco-friendly alternative to other toxic cleaners. Now let's get to the good stuff, here are 15 different cleaning concoctions you can come up with at home to keep it squeaky clean. This all purpose cleaner can be used all over the home to wipe down surfaces, and sanitise your home. Equal parts white vinegar and water. Add around 10 drops of essential oils to offset the vinegar smell, however this smell should disappear soon after cleaning down surfaces. You can also try infusing your vinegar with the rind of lemons or oranges to offset the scent. You can do this by adding citrus rinds to a jar, cover with white vinegar, seal and store in a cupboard for 2-4 weeks. Once the vinegar has infused, strain and use alongside normal vinegar in this mixture to add a fresh scent (this is a concentrated liquid so you don't need much of it to get a nice smell). Avoid use on marble, stone or granite surfaces. For a sparkling loo, glug in some white vinegar, a good shake of bicarbonate of soda with around 10 drops of your favourite essential oil into the basin. Leave to sit for a few minutes, scrub with the toilet brush, fizzing up the mixture and getting rid of all the nasties. Use the above all purpose cleaner for surfaces, leaving to sit for a minute or two before wiping away. Soap nuts are a traditional and simple way to clean your clothes. 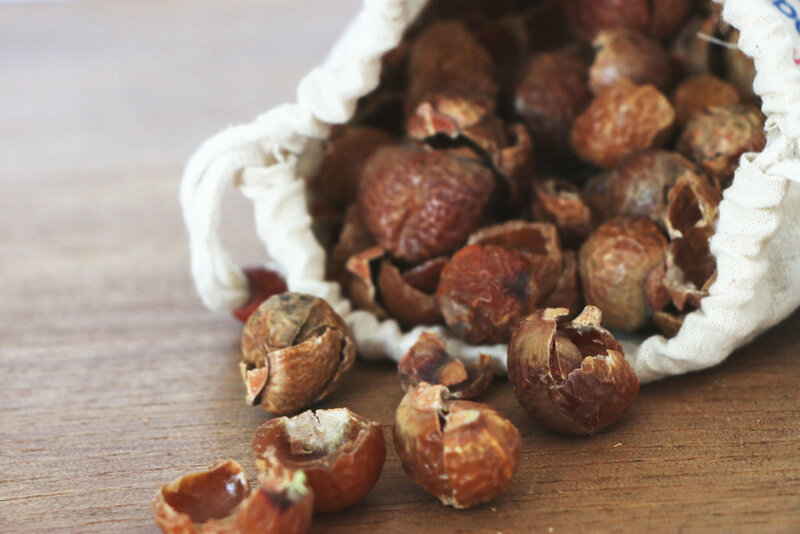 When the soapnuts are mixed around in your washing machine, they will release saponin, dissolving dirt and cleaning your laundry in the process. You can simply add them into your washing machine in a pouch, grind them up or make them into a homemade liquid detergent by boiling them in water. You can reuse the soapnut pouch for around 4 to 5 washes, until they turn grey. And the coolest thing is that when you're done with them, they can be composted in your garden! Mix together 1 part white vinegar to 4 parts water and use on your windows or mirrors to polish and clean. I also add in some essential oils for a fresh scent. My favourite to use for this is lemon. Try to avoid doing this on a hot day as can leave streaks. Fill a spray bottle up with water and around 10 drops of your favourite essential oil, such as lavendar. Give it a sniff and a spray, and add a few more drops of oil if it needs it. Go slowly, less is more when it comes to essential oils! When you're happy with the scent, then you can use it to freshen up the air, your furniture or linen. Fill a spray bottle with white vinegar (optional: add tea tree oil for added mould and mildew killing properties) and spritz the affected area. Let it sit for around 30 minutes and rinse off the area with warm water. Scrub off with a cloth if it needs some assistance! Place a small cup of vinegar and the juice of a lemon in the microwave and switch it on for 2 minutes. Leave the door closed for a further minute or so to steam, then open and simply wipe down the inside with a damp cloth. No need to awkwardly scrub! Castile soap works perfectly as a washing up liquid as well! Simply mix 4 parts castile soap to 1 part water in a repurposed container of your choice. Olive oil works perfectly as a furniture polish. Mix together 1/4 cup of white vinegar, 3/4 cup of olive oil and the juice of half a lemon. Vinegar is back again as an amazing way to clean your floors! Just add 1/4 cup to your bucket of hot water with a squeeze of castile soap. Scrub away! Fill a jar with bicarbonate of soda and 10 drops of essential oil. Shake together and store for use on carpets when they need freshening up. Shake over carpet, leave for up to 30 mins and vacuum. Your carpets should smell really lovely and fresh. Combine 1/4 cup bicarbonate of soda, 1 tsp of salt and some water. Keep adding water bit by bit until you create a paste. Cover your oven in the mixture and let it sit overnight. Scrub and wipe clean the next day with a damp cloth, and voila, sparking oven! To disinfect your chopping boards, chop a lemon in half and rub over the surface of your chopping board, then wipe clean. If you have any tough stains, then you can squeeze some of the lemon juice onto the chopping board and let it sit for a few minutes before wiping it off. For a blocked drain, pour a good amount of bicarbonate of soda followed by some white vinegar to your drain. These two ingredients will react together to break down any dirt, grime and grease clogging up the drain. After 10-15 minutes, pour boiling hot water down the drain to clean everything out (make sure to only do this on metal pipes, as the boiling water could melt the plastic pipes - otherwise just turn on the hot water tap). This stain remover should come to the rescue for any accidents you have! Mix together 1/4 cup white vinegar, 1/4 cup bicarbonate of soda, a squeeze of castile (or any liquid) soap, and 2 cups of water. Give it a good shake and keep in a spray bottle to use whenever you have a tough stain on your clothes or the carpet. Let me know your favourite homemade cleaners in the comments down below!